The world's largest beverage-maker, Coca-Cola, plans to remove a controversial ingredient from some of its US drinks brands by the end of this year, following an online petition. Brominated vegetable oil, or BVO, is found in Coca-Cola fruit and sports drinks such as Fanta and Powerade. Rival Pepsi removed the chemical from its Gatorade sports drink last year. In Japan and the European Union, the use of BVO as a food additive is not allowed. Pepsi has a plan to remove the ingredient from its entire product portfolio. It uses BVO in its Mountain Dew and Amp Energy drinks sold in the US. BVO has been used as a stabiliser in fruit-flavoured drinks as it helps to prevent ingredients from separating. According to medical researchers at the Mayo Clinic, excessive consumption of soft drinks containing BVO has been linked to negative health effects, including reports of memory loss and skin and nerve problems. BVO was dropped from the US Food and Drug Administration's "Generally Recognised as Safe" list of food ingredients in 1970. However, drinks companies in the US are allowed to use BVO at up to 15 parts per million. Coca-Cola spokesman Josh Gold stressed the move to remove BVO was not an issue of safety. "All of our beverages, including those with BVO, are safe and always have been - and comply with all regulations in the countries where they are sold," he said in a statement. "The safety and quality of our products is our highest priority." Coca-Cola said it would switch to using sucrose acetate isobutyrate or glycerol ester of rosin, which is commonly found in chewing gum. 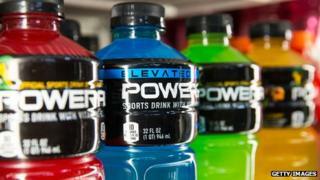 The Atlanta-based company said two flavours of its Powerade sports drink - fruit punch and strawberry lemonade - have already replaced BVO with glycerol ester of rosin. Coca-Cola said that BVO was not used in many nations other than the US, but it would be removed from products in Canada and Latin America. Coca-Cola's decision to remove BVO from its drink reflects a growing move among companies to reconsider certain practices due to public pressure. The campaign against the use of BVO was begun by Sarah Kavanagh, a teenager from Mississippi, who questioned why the ingredient was being used in drinks targeted at health-conscious athletes. Thousands of people have since signed her online petition on Change.org to have BVO removed from drinks. Can big food firms get us to eat more healthily?